Snap Inc., parent company of the wildly popular app Snapchat, started a nationwide craze over a pair of sunglasses when they dropped a vending machine, dubbed “SnapBot,” in Venice two weeks ago. 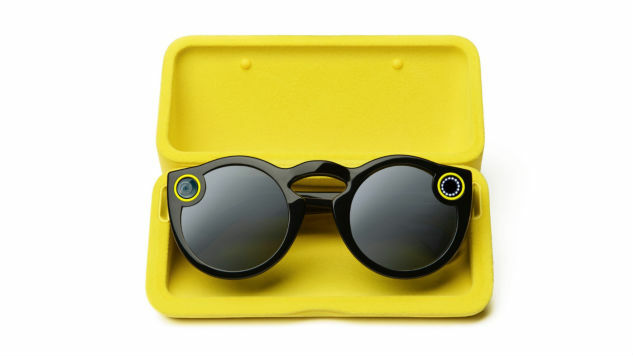 Spectacles is a pair of sunglasses that has a small camera built right into them that allows users to record 10-second videos and post them to their Snapchat accounts. They come in three different colors (black, coral, or teal) and only available in one style. After pairing it with your phone, all you have to do is hit the button on the left and it’ll start recording a 10-second snap. You can tap it again so it’ll record continuously up to 30 seconds. You can export the videos but it’ll be in a circular shape because of how you view them on Snapchat. When someone posts a video from Spectacles, you’ll be able to rotate your phone to either landscape or portrait mode to be able to see a little more. Videos are also shot with an 115-degree lens because this is the closest to what the human eye sees. You can get them by finding a SnapBot, however, they come and go. So far, they’ve been in a few different places (California, Oklahoma, Arizona, and Florida). If you’re in Manhattan, they opened a pop-up show right by the Apple Store on Fifth Ave. that will be open until New Year’s Eve. Other than that, you can try your luck on eBay or Craigslist but the resale value is currently around $300. But is it the next evolution of social media or just another gimmicky wearable? Let’s start with The Good. If you are obsessed with or a “Snapchat power user”, the Spectacles are a must have. You can record videos hands-free and capture moments the way you saw it. You can be more in the moment and record videos without having to pull your phone out and stare through a screen. All you have to do is push the button on the side and you’re recording whatever is in front of you. It is very easy to use and is definitely way faster than pulling your phone out, launching the app, and holding down the button to record. By the time you do all of that, the moment you are trying to record might have passed already. Snapchat actually put some thought into the design and settle on something that is subtle and not too loud. The only thing that gives it away (other than the camera) is the light the on the top corner of the glasses that turns on when it is recording a video (for privacy issues). There is also a little light on the inside left corner of your eye to let you know you are recording video but hard to see it when you’re in the sun. Battery life isn’t that bad either. You could get about 100 snaps on each charge and the case can hold four additional charges. While testing the Spectacles, I was able to go a whole week using only the case to charge it. Since the camera is in the upper corner of the glasses, it could get blocked if you have long hair and what’s worse is that you won’t know until you’ve imported the footage into the app. While it’s cool to be able to record videos hands-free, you may be disappointed later to find out something was obstructing the lens the whole time.You just need to be more mindful of your hair or hat brim getting in the way while you are recording with Spectacles. Also, since the glasses sit on your head, you might not be able to capture videos from different angles than you would if you had your phone in your hand. There were times where I wanted to shoot a video from a low angle, which meant I had to get down on one knee but decided to pull my iPhone out instead because it was easier. Spectacles are great but it doesn’t mean you have to use it all the time. I love having it but I also love using my phone because it was more mobile at times. The biggest complaint I have, along with many other Spectacles owners, is how clunky the app is. Yes, it’s great if you’re using the Snapchat app regularly without Spectacles because we are used to it and it is intuitive. However, syncing Spectacles, editing the snaps, and posting them is a pain. To sync your footage, you need to open app, swipe up to get to Moments, wait for it to sync (20 seconds for each SD video and 40 seconds for HD), click on the group/folder where all the files are stored (separated by date), tap on the video you want to edit, add a caption or geo-filter, and then you’ll be able to finally post it. The whole process takes longer than it normally would take if you were just using your phone to capture and send a Snap. I’m sure the developers are working on a better UI experience and I’m sure fellow Spectacles owners are hoping for an update real soon. It is interesting to see where they go from here since they have rebranded themselves as a “camera” company and also see how their competitors will respond to this. In fact, many of the most popular threads in Snapchat such as crazy face filters and clutch zoom-ins aren’t even something you can do with Spectacles. While that might disappoint some, Snapchat is a company that’s made its name on constantly reinvented itself to stay in the spotlight of young social media users. It’s great to see Snapchat continue that trend and bring more of a vlogging vibe to what the platform is for. For $129, you actually get a lot. Though the glasses only work with Snapchat, it is a must have for anyone that is obsessed with the app. It is a great first generation product from a company that just had a mobile app before this. At this price, you’ll be able to take your Snapchat game to the next level and be the envy of all your friends.